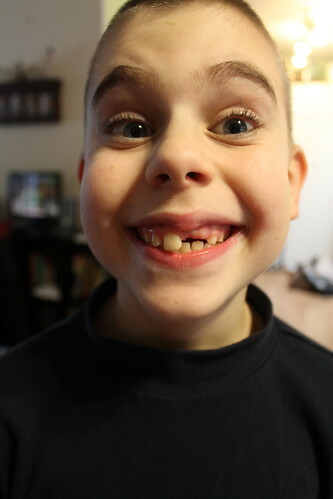 One and a half years ago Aidan had these two front teeth pulled, and here they are still missing. After months of waiting for these teeth to come in the dentist finally sent us to a pediatric specialist, who sent us to an orthodontist who is going to send us to an orthopedic surgeon…long story short (kind of), he has an extra tooth up there that is keeping the tooth from coming in, and we waited too long to have the surgery so just removing the extra tooth wont be enough, he will have to have braces put on, then the surgery to remove the extra tooth and a little gold button and chain attached to the tooth/teeth, and then they will attach the chain to the braces and pull those suckers down into place. 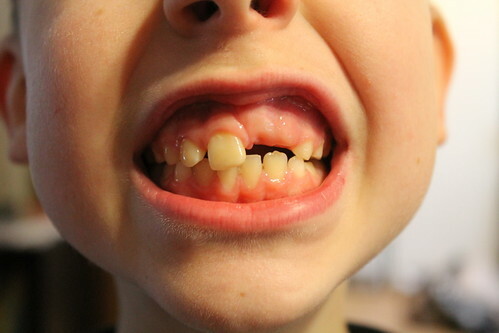 This entry was posted in Aidan, Braces. Bookmark the permalink.